In the January 21st 1911 edition of ‘Boxing’ under the article headed ‘Welsh Notes’ there appeared the following: “Wanted – a smart boxer. A well-known American sports promoter has just written to me from across the Atlantic to ask me to recommend a smart boxer for a trip across the water, and the terms, which I do not care to make public, will gladden the heart of the selected man. At present I have two lightweights in view, both good men, but I am in no great hurry to make the selection, as circumstances allow me ample time to do so.” The article was penned by the Welsh correspondent, Charles A Barnett, and it referred to an invitation he had received from a wealthy racehorse owner and sports promoter, Frank Torreyson. The following week Barnett wrote that “As might have been expected, quite a shoal of boxers have written to me offering their services in answer to the announcement that I made last week.” Barnett added that he had been given a name by Torreyson and that until this person had accepted or declined the offer he would look no further. Nothing further was mentioned regarding the matter until March 25th when Barrett wrote that “Some time ago I announced that I had received £20 from an American promoter in order to select a good class boxer and pay his passage out to the States with a contract lasting a year. Two men were mentioned in the letters that I received – Fred Delaney and Fred Dyer – though I was not pinned down to either. Unfortunately Delaney was up North, and Dyer also had a few engagements on, so that each was forced to delay the acceptance. 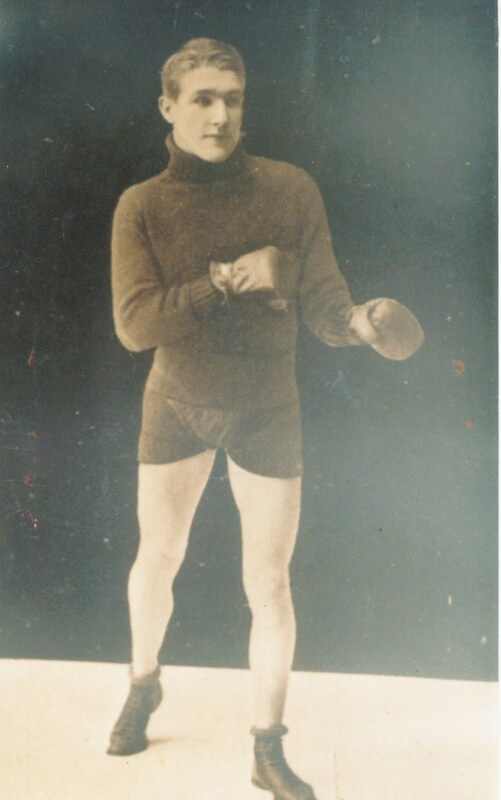 The American season is now, of course, drawing to a close, and I have decided, after hearing from the promoter, to postpone the offer until next September.” Delaney and Dyer were lightweights of the top class at this time and either one of them would have done well in the States. 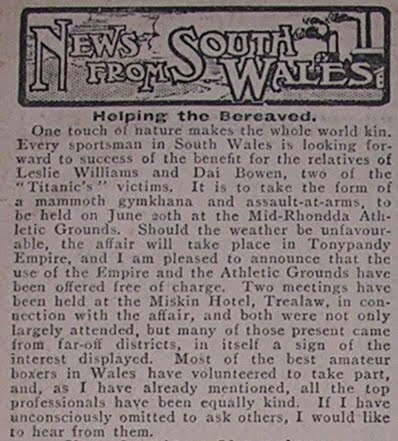 The Nazareth House tournament that Williams had appeared on had occurred on March 5th 1912 at the Park Hall in Cardiff. Nazareth House was a Roman Catholic institution and they organised an annual charity tournament to which they invited famous boxers to spar. Williams had impressed Jim Driscoll by his showing against Joe Bowker, the ex World Champion, and Bowen had also boxed on the promotion against Young Walters of Pontypool. I suspect that it was at this show that Barnett fixed on the two men to make the trip. In the spring of 1912 Leslie Williams and Dai Bowen were undoubtedly boxers of promise. 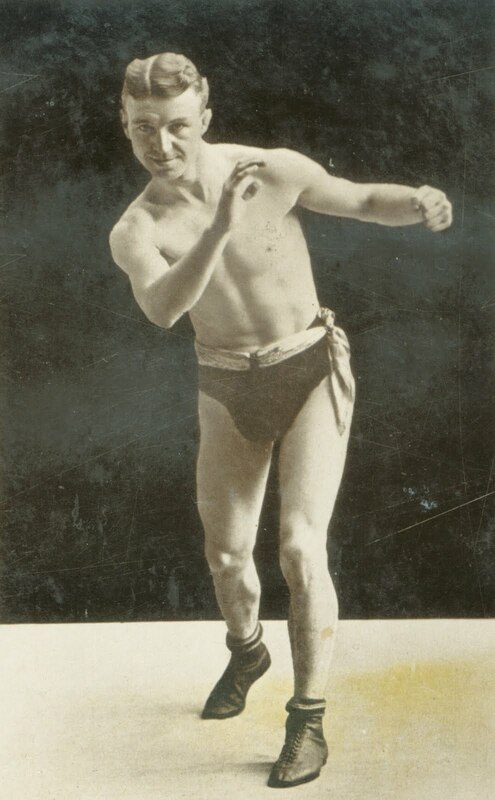 They were some way short, however, of the class of Dyer, Delaney and Morgan, and I wonder what Torreyson would have made of them had they ever arrived in the States and stepped into the ring against some of America’s finest. 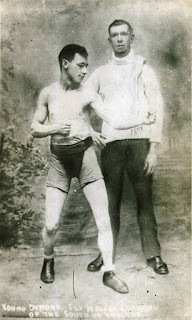 Even allowing for the poor reporting of professional boxing in Wales at the time, and also for the fact that many contests took place on boxing booths rather than in halls where the press would be in attendance, it is difficult to find many contests for either Williams or Bowen before they set sail and I suspect they were much less experienced than any of the boxers that Torreyson had asked for. Williams had had ten traceable contests and Bowen six. Although both men had graduated to 15 and 20 round class against some decent Welsh featherweights and lightweights, they had not yet met the leading lights from England and Scotland. 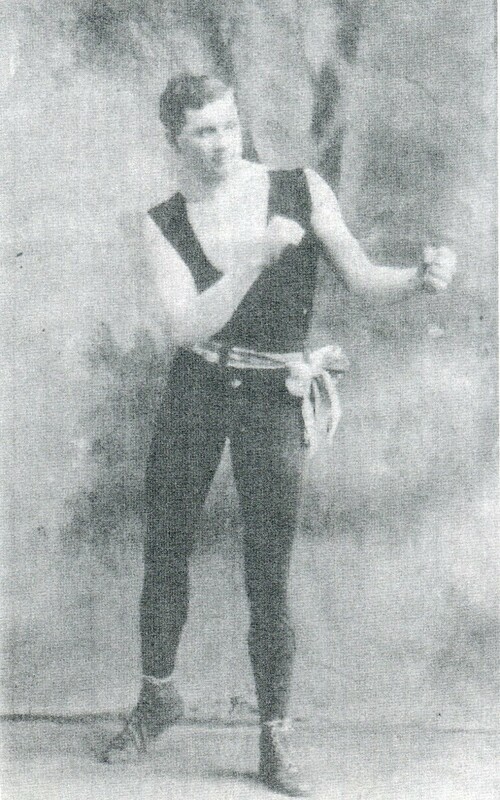 Bowen was a promising young fighter and Williams, although he had beaten the likes of Ike Bradley (Liverpool) and Young Warner (Marylebone) had recently been knocked out by Will Galley (Wrekeneton) and Arthur Evans (Tirphil), men of high class. Barnett must have either seen something special in both men to propose that they make the trip. 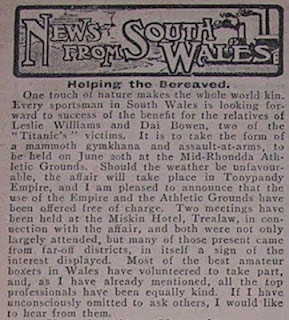 Meanwhile in Southampton, where the ‘Titanic’ was due to begin her voyage, a young man was taken on by the White Star Line to be a Stoker/Fireman on the new vessel. Frank Dymond was nn years old at the time and he was also a professional boxer. I have only been able to trace one contest for Frank before 1912 and this took place on October 16th 1909 at the Empire Theatre in Southampton when the young boxer was knocked out in the third round by Jack Keller (London). 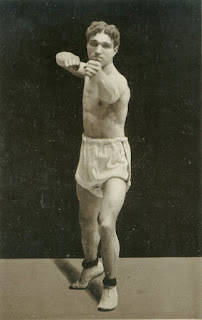 I suspect that Kellar was a relative of Sam Kellar, a leading London flyweight before the first world war. It is most likely that Dymond took part in many contests in and around the Southampton area at this time but these contests have not yet been traced. The great ship left Southampton on Wednesday April 10th 1912 with Bowen, Williams and Dymond all on board. After stopping in Cherbourg, France and then Queenstown, Ireland the ‘Titanic’ commenced her voyage across the Atlantic. One can imagine Bowen and Williams undergoing rigorous exercise in the gymnasium while Dymond was working at least as hard, many decks below, shovelling coal into the ship’s huge furnace. At 11.40 pm on Saturday, April 14th the vessel hit the iceberg and within 150 minutes she had sank. Dymond had been on his way to start his shift when the accident occurred and he found that the door to the boiler-room was shut and the stairwell flooded. He immediately went up onto the starboard deck where he assembled with other crew members. The lifeboats were being lowered and the call had gone out for women and children to get into them. The last two lifeboats on the starboard side, numbers 13 and 15 were readied and Dymond was instructed to get into Lifeboat 15, the last lifeboat to be lowered from this side of the ship. As he was being lowered Dymond saw that Lifeboat 13, which was still under tension, had drifted back towards the ship, due to the backwash caused by the condenser of the ‘Titanic’ and was now directly below Lifeboat 15. Dymond desperately shouted up to the deck to ask the officer in charge to stop the lowering but was not heard. The crew of Lifeboat 13 managed to cut the ropes and drift away in the nick of time and Dymond then found himself in charge of about seventy survivors. Eventually they were picked up by the ‘Carpathia’ and they docked at pier 54 in New York City on April 18th. Dymond,along with the other 213 surviving crew members were put aboard the ‘Lapland’ on April 20th and they arrived at Plymouth on April 29th. They were all escorted by Board of Trade officials to a secure building where they could be questioned, although they insisted on trade union officials being present before they would answer any questions. 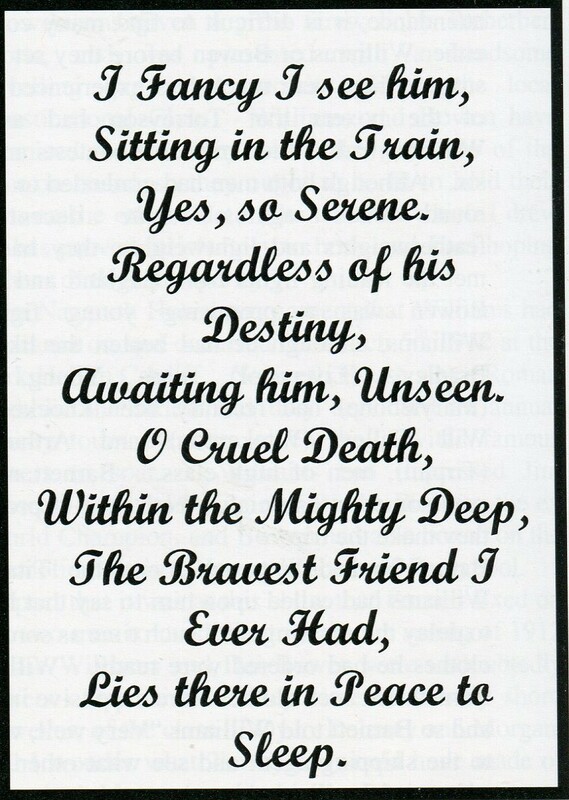 On April 30th Dymond was put onto a train for Southampton and he returned to his family. Neither Bowen or Williams were lucky enough to board a lifeboat. Along with the majority of those aboard ship, and the vast majority of men on board, they perished in the freezing waters of the North Atlantic. With a water temperature of 28 degrees it has been estimated that most died within ten minutes of hypothermia or cardiac arrest. There was room for about 500 more people in the lifeboats but only thirteen lucky individuals were plucked from the sea. Barnett must have felt a degree of responsibility towards the families of Bowen and Williams. He had personally selected these men for the American tour, little realising that in acquiescing to Williams’ request to delay their departure, he was sealing the fate of both men. He was not, of course, responsible in any way for their deaths, but the decisions that he made must have been hard to bear. 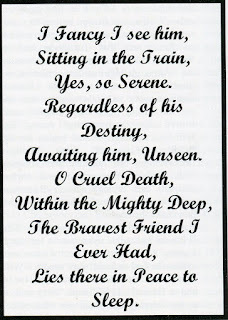 He took an active part in publicising, and arranging, the many benefit tournament that took place in South Wales during May for the dependants of the two deceased and I am sure that Barnett never forgot them. Dymond's son, also called Frank, boxed after the first world war, when he took part in a number of 15 round contests against some excellent flyweights. I suspect old Frank was in his corner, encouraging his son. He never went to sea again, preferring to work on the tugboats that busied themselves in the waters around Southampton harbour. I am grandson of leslie Powell named after aforementioned boxer as his brother was asked to go but mother wouldn't let him. My uncle I ke Powell wrote in the national press accordingly. Will see if I can find the press articles.